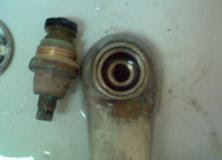 If a dripping tap cannot be stopped with a new washer it probably needs reseating. There is a special reseating tool for this job. Sometimes water finds its way behind the washer wearing a groove in the jumper this groove can be removed with a flat file. 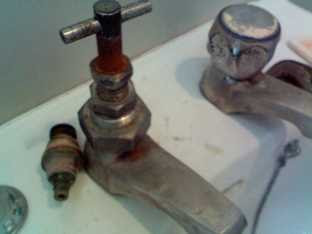 Newer taps will jamb altogether if the washer becomes flat and the inner jumper that carries the washer runs out of thread. In this case the tap will need to be dismantled, rewashered and reassembled insuring that the retaining circlip is in place at the top of the spindle (see diagram).